Being surrounded by a diet-obsessed culture full of rights and wrongs, dos and don’ts, can make it hard to adjust to a totally new concept in which there is no “right way”. When developing the skills of an intuitive eater, one can become stuck in thinking that they can only eat when they are hungry, or that they should only ever eat foods they really feel like them. Another common belief is that it’s imperative every meal is eaten mindfully. The “everys” and “onlys” create rigid rules that are incompatible with the unpredictability and dynamicity of life (sounds a lot like a diet hey?). The more rules there are, the greater the chance a rule will be broken, which very unhelpfully reinforces the feeling that one is “failing” or “has no willpower”. The 10 principles of Intuitive Eating are just that, principles. Applied flexibly, they allow for both instinctive and insightful decisions around food. For example, you may eat your lunch a little early even though you’re not quite hungry yet because you have 3 hours of meetings up next. You’ll be starving if you wait until they’re finished to eat, and you know from experience you tend to choose fewer nourishing foods and eat really quickly when you get too hungry. Or, you might have brought leftover curry to work, only to find you aren’t that interested in it anymore. Being budget conscious, you may still eat the curry, but make a point of checking in with your body for your afternoon snack or dinner later to ensure you honour your preferences and eat something you truly feel like. Your core behaviours for survival don’t follow a set of rules. Your body will tell you when you’re tired, thirsty, unwell or need to go to the toilet whenever it feels like it! Eating is no different, and the intuitive eating process simply provides a framework to work with as we step away from the rule book. 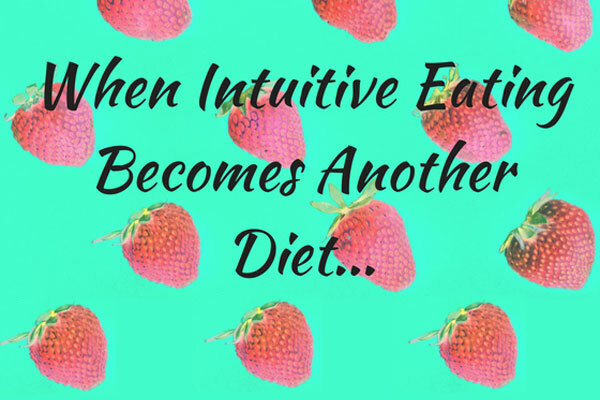 If you’d like to read more about an intuitive eating pattern, I suggest checking out the book “Intuitive Eating” by Evelyn Tribole & Elyse Resch.